I wrote the following, and then read it to one of my high school classes on May 30, 2000 – our last day of high school. What fascinates me is that for the past four years I have managed to avoid expressing how I truly feel about all of my friends. I pass people in the halls that appear to be good friends, yet I vaguely know what makes them tick. For this reason I wish that high school could continue so that we could all out-grow our prejudices and perhaps get to know each other better. There are so many cliché sayings that I could use to sum up my high school years that it is tough to choose one. The same goes for songs. So, as I glance back on what simple knowledge I have learned, I will incorporate it with quotes from works we have read this year. A sort of tribute to you and your class, Ms. Shelley-Barnes. In the words of Darcy from Pride and Prejudice, “In vain I have struggled. It will not do. My feelings will not be repressed. You must allow me to tell you how ardently I admire and love you [all]!” (Austen) Over the past four years, I have had some of the most fun times of my life, a direct result of meeting and getting to know some of you. Nowhere do I feel more comfortable than at this school surrounded with friends. What would life be without friends? I would rather not imagine. “If wealth flows upon one, one may be perhaps / Luckier than one’s neighbor, but still not happy.” This is a line from a play by Euripides titled, Medea, that in the context I mean to use it, means that one should always look past money, beyond clothing, cars, and other material items and discover who people really are. There will always be richer people and poorer people, but never anyone that is happier than you if you are content with yourself. I like to think of it as being an eternal child, never growing-up or giving in to the harsh realities of the world. My mom reminds me of this simple thought, telling me just the other day to never grow-up. Attack the world with the mindset that life is fun and that it is a joy to be here. “What is value and wisdom to one man seems nonsense to another.” (Hesse 145) Throughout life, remind yourself from time to time that everyone has their special abilities, and in one way or another they are better than you. Learn from them, and though you may never achieve Buddha status as Siddhartha did, you will appear all the wiser. “Find the source within [your]self,” that is, figure out what you love to do. Then do it. If you love whatever you do in life, you will never have to work a day. I don’t know if colleges have lockers, but if not they are certainly one of the things I will miss from high school. Other things such as meeting in the grade wings in junior high to talk with friends, racing to get to the front of the lunch line, holding a girlfriend’s hand between classes, writing notes so secret that if anyone else, especially a teacher, reads them, you would die, and school busses (a/k/a cheese wagons). I will miss all of you, too. T.S. Eliot wrote in Four Quartets, “What we call the beginning is often the end / And to make an end is to make a beginning. / The end is where we start from.” This day marks the end of a significant period of our lives, but also marks the beginning of the rest of our lives. Use the rest of your life to its fullest and you won’t have any regrets. It is at this point that I sign-off, leaving you what I have learned, and letting you all know that you have my respect and I wish you the very best in life. This entry was posted in Chris' Writing, Our Experiences on 30 May, 2000 by Chris. The date of this post is the approximate date of the trip, but I posted it 15 years after! 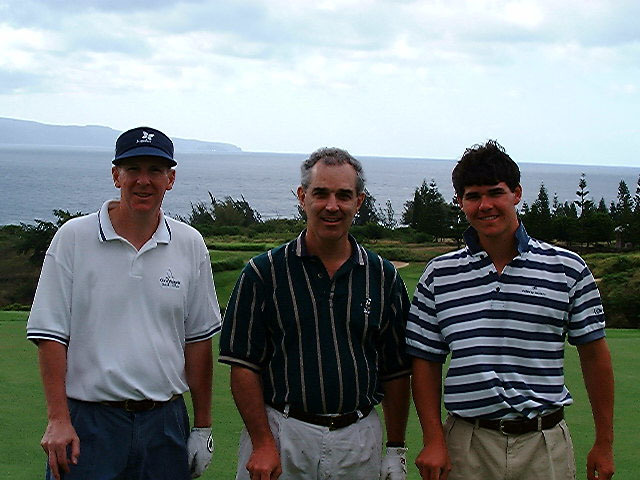 Dad and I traveled to Hawaii to meet up with a friend of his, Bill Raduchel, who was hosting a guys golf trip of sorts. We played all three Kalalua courses (since the trip they’ve eliminated one of the three). 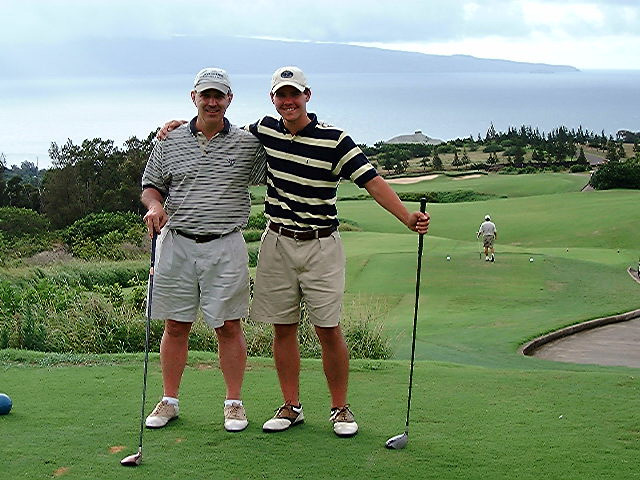 It was a blast from a golfing perspective, and a fun time with dad. I hope to go back someday to refresh my memory of the Plantation course. 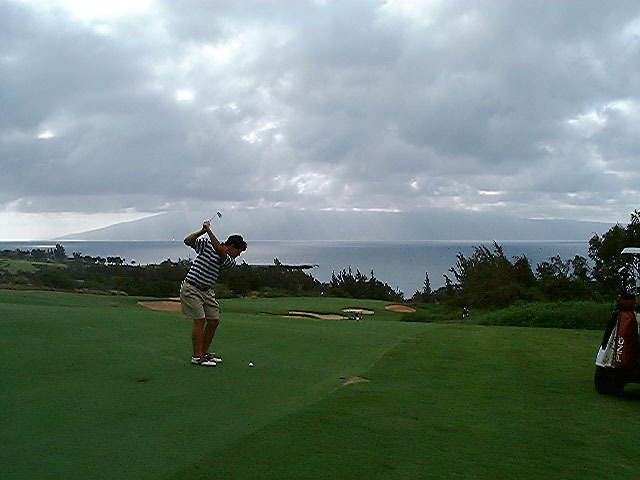 This entry was posted in Golf, Our Experiences, Travel on 29 May, 2000 by Chris.